Hereford FC have launched an investigation after their Southern League Division One South and West match at Didcot Town was abandoned on Saturday because of crowd trouble. It is alleged that the Didcot keeper was headbutted as several Bulls fans came onto the pitch after they scored. Hereford were leading 2-1 when the incident took place in the 87th minute. A club statement said: "Hereford FC is deeply concerned by events that unfolded at Didcot." "Club officials will be working very closely with the local police, Didcot Town, stewards who were in attendance, the Football Association and the Southern League to establish the relevant facts." It is likely that the result will not stand and that the game will have to be replayed. Hereford are concerned about possible sanctions and will make no further comment while the investigation is ongoing. 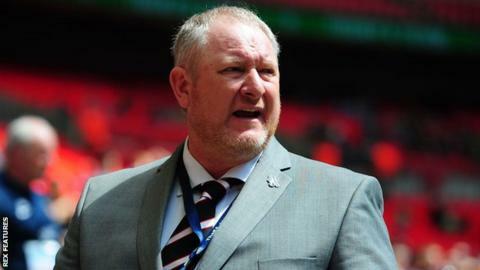 "I feel for the players," manager Peter Beadle told BBC Hereford & Worcester. "They put everything into it for the 87 minutes that we did play. "Everything that went on at the end is most disheartening after the way the lads fought back as they did. "Everyone was so ecstatic when the goal went in, the players were delighted and the supporters were delighted. What happened after is just a shame." Hereford, who reformed in 2015 in English football's ninth tier after the demise of Hereford United, are on course for a second successive promotion. Having lost just once all season, they stand 14 points clear at the top of the table with nine games to go, including the Didcot game - if and when it is replayed.